This Paleo & Whole30 Chicken Cacciatore recipe is a quick, simple, one-pot wonder but tastes divine with chicken that literally falls off the bone and veggies melded together in savory perfection. Our family is following the Whole30 plan, and I’ve made a new post for each day, summing up our ups and downs along with the meals we had each day. You can find those posts here: Thirty Days of Whole30 Recipes. Up until now, I’ve included each day’s meals in the same post. Well, this Paleo & Whole30 Chicken Cacciatore is so darned good that it had to have its own separate post. I found this Paleo & Whole30 Chicken Cacciatore recipe in The Whole30: The 30-Day Guide to Total Health and Food Freedom. If you’re following the Whole30, and you don’t have this book, get it! I didn’t have it on my first attempt with the Whole30, and I only made it about ten days. It has been a total game changer for me this time around. If you’ve read It Starts With Food, then The 30-Day Guide to Total Health and Food Freedom is a great refresher, summarizing what you learned but also giving you loads of great recipes along with a seven-day meal plan to follow and the information you need to create your own meal plans and complete the plan successfully. Anyway, on with the recipe! I tweaked the original recipe to add more veggies. This Paleo & Whole30 Chicken Cacciatore recipe is a quick, simple, one-pot wonder but tastes divine with chicken that literally falls off the bone and veggies melded together in savory perfection. Trust me when I say don’t leave out the capers! Each little pod brings a burst of intense flavor to your tastebuds. Mmmmmm! Heat 2 tablespoons of coconut oil over medium-high heat. Season both sides of the chicken with the sea salt and freshly cracked black pepper, and place it in the pan. I used my trusty Lodge 7.5 qt. Dutch oven. Sear the chicken until browned, about 5-6 minutes on each side. In the same pan, add the last tablespoon of coconut oil, onion, and pepper, and sauté for 4 to 5 minutes until the onion starts to become translucent. This is a good time to scrape the crispy chicken bits from the bottom of the pan and stir into the mixture so you get all of that flavor in your final dish. Add the garlic and stir for 1 minute until fragrant. Add the capers and diced tomatoes. Add the chicken back to the pan along with the chicken broth. Cover and simmer for 30 minutes or until a meat thermometer reads 165°F. 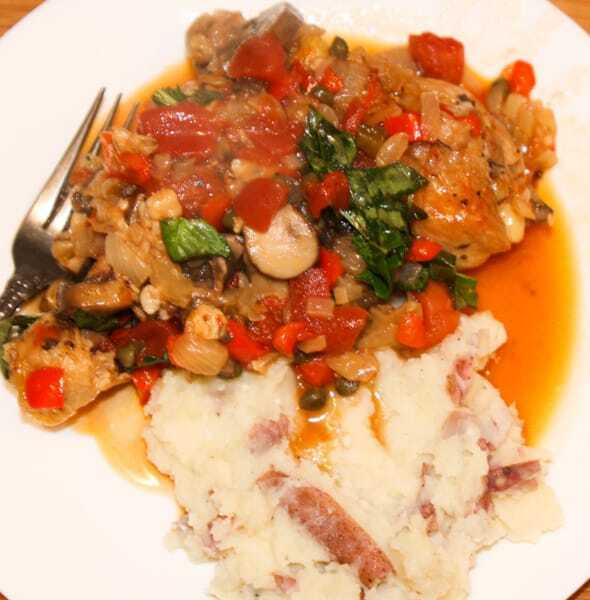 If you’re following the Whole30 plan, serve this Chicken Cacciatore over some Garlic Smashed Potatoes with ghee, salt, and pepper. Yum! If you’re inspired to try this recipe, leave a comment and let me know what you think and what variations you made! This looks so good! I plan to repost this in my latest blog post this week! Reminds me of what my mom used to make when I was young. This is also great since I’m starting Whole30 next week. I love, love, love this recipe. It’s so easy and full of flavor! Good luck on your Whole30! Thanks Kristi! I start Whole 30 tomorrow and I can’t wait to try this recipe! Thank you! I’ll definitely check it out. I’m always looking for new recipes. Looks so great! I’m going to make this today! Dcould you also post the nutritional info? Easy recipe. I just prepared it and I cannot wait to dig in. It smells delish!